Over the past month, Jack Follman from “Pacific Takes” at SB Nation, has been doing a six-part list of the “Top 100 2015 Pac-12 Players,” and naturally, there are several Oregon players listed. So, let’s discuss how the list ended up. The Ducks take the top spot on the list with 17 players in the top 100, with UCLA and USC finishing second and third with 14 and 13 players, respectively. Also, some bragging rights are in order as Oregon State has only three players listed — talk about opposite ends of the spectrum — Duck fans have it pretty good these days. 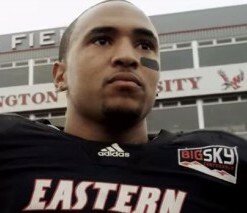 Eastern Washington transfer, Vernon Adams. Quarterback is the biggest question mark for Oregon this season, and the starting job will go to either Jeff Lockie or Vernon Adams. Both players could be effective for the Ducks, but some people believe that Adams could have the green and yellow playoff bound once again. In fact, both potential Duck signal callers made the top 100 list (Lockie No. 82 and Adams No. 52), but neither cracked the top-6 in the conference QB ratings according to Follman. Jered Goff (No. 4) of Cal is the highest-ranked QB in the conference, followed by Cody Kessler (No. 5) of USC, Mike Bercovici (No. 31) of Arizona State, Anu Solomon (No. 40) of Arizona, Sefo Liufau (No. 47) of Colorado, and Kevin Hogan (No. 50) of Stanford. However, Follman does write that Adams is, “The hardest guy to peg in the entire conference. Adams could seriously be a Top 10 Pac-12 player based on what we have seen him do to Oregon State and Washington.” Considering he hasn’t proven anything at the FBS level, his low ranking is somewhat understandable. But I refuse to believe that Hogan, Liufau, Solomon, and Bercovici will finish the season with better numbers than Adams — if he wins the starting job that is. 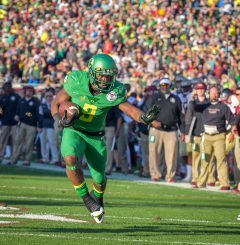 Royce Freeman has vaulted himself into the Heisman conversation. Aside from quarterback, Oregon is loaded with both youth and experience at every skill position. The Ducks have the best backfield in the conference, and Royce Freeman has the potential to be a first-round pick when he decides to go to the NFL. Freeman comes in at No. 10 overall on the top 100 list. Follman stated, “Freeman is big-time and was arguably the best running back in the conference last year as a true freshman. He is going to put up huge numbers in Oregon’s system.” Freeman is actually the second-highest back on the list, behind Devontae Booker (No. 9) of Utah. Freeman, who ran for 1365 yards and 18 TDs last season, will lead a very talented backfield in an offense that should be once again in the top-10 nationally in total rushing yards. He should have more than 1000 yards fairly easily, but Thomas Tyner, if he stays healthy, could reach that milestone, as well. Tyner is No. 29 on the list and is the No. 6-ranked running back in the conference, two spots behind Storm Woods (No. 27) of OSU. Tyner has the skills and size to be a starter for any team in the nation, and having him come in to spell Freeman is a major asset for the Ducks. If he can build off his strong finish from last season, the Oregon backfield could be the best in the nation. Byron Marshall is a dangerous weapon for the Ducks. Another position Oregon is loaded at is wide receiver, and many people think this group could be the best unit in the program’s history. With Byron Marshall being named to the Biletnikoff Award watch list and Bralon Addison returning from his knee injury, the Ducks have the leadership at a position filled with young up-and-coming talent. Marshall might have transformed himself into an NFL-caliber receiver with his impressive 1000-yard year last season, and Addison had 61 catches, 890 yards, and 7 TDs his last season in 2013 and took two punts for touchdowns. Follman has Marshall ranked No. 24, behind only Cayleb Jones (No. 23) of Arizona, Nelson Spruce (No. 21) of Colorado, and running-back-turned receiver for 2015, DJ Foster (No. 13) of Arizona State. Being the fourth-ranked receiver in the Pac-12 after just one season at the position is a testament to Marshall’s raw talent, team-first attitude and potential at the next level. Aside from Marshall, Addison comes in at No. 62; and it’s interesting that he came in as the 10th-best receiver in the conference, considering how explosive he was before his injury. He will have to share time and catches with the other talented pass catchers on the Duck roster, but if the spring game was any indication, Addison looks healthy and ready to turn heads once again. Devon Allen (No. 68), Darren Carrington (No. 76), and Dwayne Stanford (No. 94) all made it on the list as well; and fun fact – the Ducks have the most receivers listed in the conference with five. With so much talent at the skill positions, Oregon should be fine offensively as long as the quarterback play is consistent. Behind Mariota, the Ducks led the nation in turnover margin for two straight years. Hand the ball off to the two talented running backs, get the ball into the hands of the explosive receivers, and the Ducks will be their normal explosive selves. DeForest Buckner will be the leader of the defense in 2015. 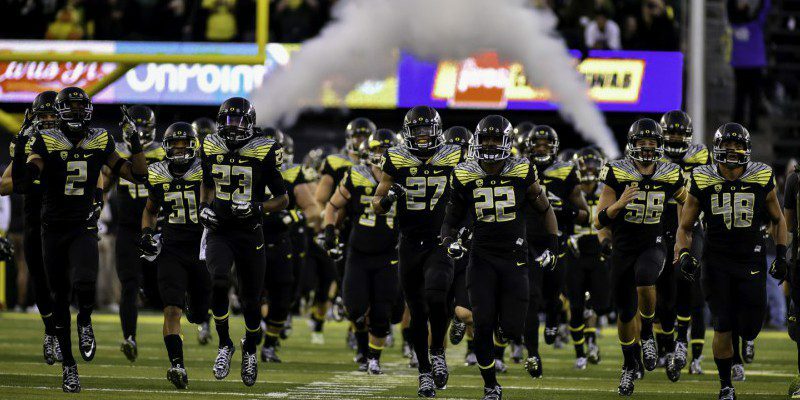 All offense aside, the highest ranked Duck is on the defensive side of the ball. DeForest Buckner comes in at No. 6 overall and is the highest rated defensive end on the list. He’s ranked behind two quarterbacks in Kessler and Goff (No. 5 and No. 4 respectively), and a trio of very talented linebackers in Su’a Cravens (No. 3) of USC, Myles Jack (No. 2) of UCLA, and the No. 1 player in the conference, Arizona’s Scooby Wright III. 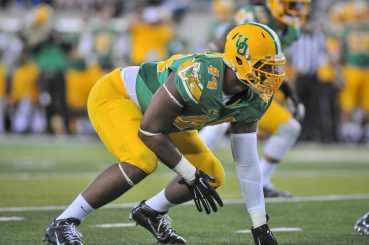 Buckner, who is on the Bednarik Award (National Defensive Player of the Year), the Bronco Nagurski Trophy (Best Defensive Player), and Lombardi Award (Outstanding Lineman/Linebacker) watch lists for 2015, has the potential to become a top-10 pick in the next NFL draft and might also acquire some awards on the way. He is easily the best Duck on the defensive side of the ball for this season. Last season was the best in Oregon history, however, the Ducks have a realistic shot to win the Pac-12 and return to the College Football Playoff this year. With a roster loaded with an abundance of talent across the board, one can see why Oregon is ranked No. 5 in the preseason USA Today Amway Coaches Poll. In just over a month, the Ducks will take the field and the season will begin. Only 33 days to go. Check out the entire list to see where all 17 Duck players rank: 1-10, 11-20, 21-30, 31-40, 41-50, 51-100.